i am loving wide leg trousers as well, they are so fun. i am really diggin' your hot pink nail polish! It´s perfect with that striped T! So gorgeous! I think I need to get a pair of flares. It looks effortless with the striped shirt and platforms. it taylor!! and Your Hair looks amazing!! I too and super stoked on this trend! you look absolutely amazing!love the colours on you! I love that blazer! It is so versatile and would fit almost anything. Great outfit.. Loving your striped top with the flared jeans!! I just had to let you know that I really like the length of your hair cut! Very cute. You look amazing in these flares! Flares are so hot right now!! I love that top!! The blue and green go so well together!! I love everything in this post, I actually think these jeans are more flattering than skinnies :) great post! I love them. Flares are so nice. Hi, found you through Kendi. I simply adore your watch & I'm starting to like Michael Kors as well! Stunning! I LOVE your hot pink nail polish in the 2nd pic - what color is it? I just got a gorgeous silk blouse to wear with my wide leg jeans. They are some oldies that just like you I found in my closet, but they are perfect. Gotta call my mom and tell her to send all my flares that I held onto. So glad I did that! This look is so great. 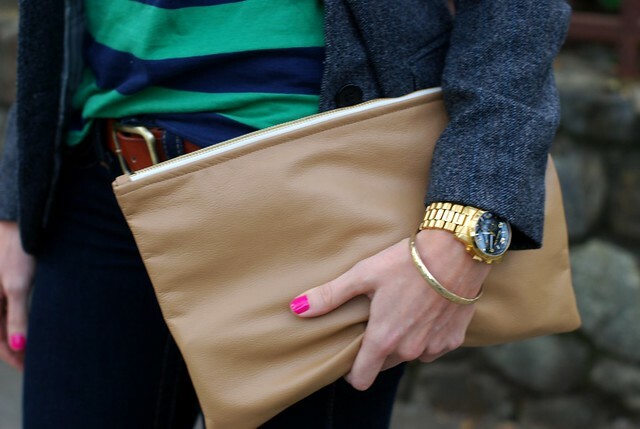 Great jeans and love the clutch! You look fantastic in the flares. I really like your adorable platforms and the H&M striped top. Love the flared jeans too! Great change from the skinnys and you look great in your True Religions! I really want to get a pair of the J Brand Lovestory jeans. They look amazing! i love the flare on you, and love that blue and green striped tee! Great look and i love your nail color! love the look and the clutch especially - great styling. Me too! Me too! I found some crazy flares on Free People the other day and put them on my Pinterest! I think everyone is excited! Love the 70s style, especially the flared jeans, so stylish and flattering. And your striped tee is so nice! love this looks on you! fab! I'm usually not big on flares but this outfit is so cute! Adore this outfit. The grey blazers everywhere are killing me. I need one. Totally agree with the 70's flare coming back in style. The line it gives every girls body is much nicer than the skinny. Nice! Gosh, I wish I could find gems like these hidden in my closet. 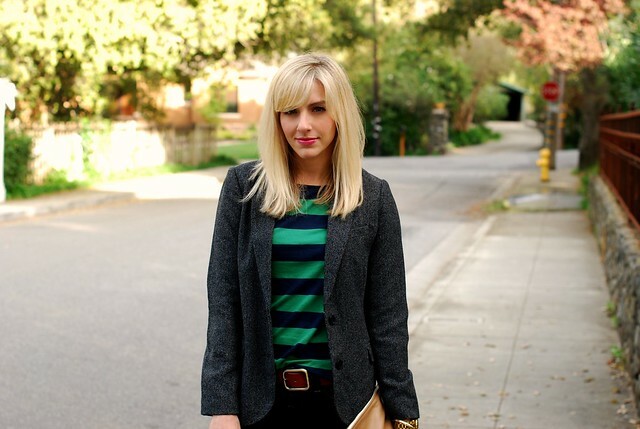 I hate skinnies on me so I am thrilled you are bringing the flare back to the blogosphere. You look great! Everyone online seems to be sporting these wide legs again and I just haven't found a decent pair to flatter yet. I like that yours are such a dark rinse and love the polish! I'm so excited to see the wider flared legs back - skinny jeans were getting tiring! This H&M top reminds me of the Libertine for Target one that was just brought back. Love the mix of bright with navy! That's a great blazer. Very flattering on you. Very cute! Love the pop of pink nails and lips with the darker colors...so lovely! Beautiful pictures. I love your outfit. Love the flares on you! Total departure from the skinnies. I haven't found a flare I am in love with yet...still on the search...really want to find a white flared jean for spring. Any suggestions? These look amazing on you, Taylor! And I love the J Brand pair you've picked out. Plus, I'm absolutely adoring your clutch. i totally agree. the wide leg makes everyone look so lean and tall. I love it. You look great! I've been wearing my wide leg J Brands a lot lately, I'm loving it. thank you ladies! I'm liking them more and more every time I wear them! Dont you just love the AA clutch!? Broke mine out for the first time this weekend. What a great buy. I love that American Apparel clutch! I'm really considering getting one to do triple duty as a clutch/computer case/make-up bag. Great post! love the clutch. got the large one and love it! try looking into rich & skinny (maybe you did - my internet is super slow and the links to the other jeans never opened!) i bought a pair a couple weeks ago at nordstrom - dark wash, high waist, HUGE flare. they're AMAZING! I love this look, I need to get me some flared jeans! :) New do? your hair looks amazing! u're so lovely!!! i def adore ur style! i have the same striped tee, love it!